- Chuck tells some bedtime stories. Some slasher films are just hard to find, and some are as rare as hen's teeth. SLEDGEHAMMER is the latter. Thankfully, unlike some rarities, whilst this early shot-on-video oddity certainly isn't going to win any awards it is cheesy (and even sometimes a little creepy) enough fun to keep most fans of the subgenre entertained. The plot is simplicity itself. A raggle-taggle bunch of overage teens decide to hold a party at a remote house, which is 50 miles away from the nearest town and phone (as you do). Unbeknownst to most of them, 10 years previously an adulterous couple had their brains bashed in by someone with a sledgehammer, whilst the woman's eight year old boy was locked in a closet as they got jiggy with it. This fact is far from the minds of the teens, who have but one agenda – and that is to get “shitfaced!”. The boys all have bulging biceps and the girls have big hair (this was 1983, after all). They settle in for a night of romance (which seems to involve belching and then trying to snog the first available woman), and a prolonged foodfight (which looks like it was a lot of fun to film). The two main characters emerge as Chuck (Ted Prior - the real life brother of the director), the blonde jock who likes to lay around with his shirt off and his fiancé Jonie (Linda McGill), who sports one of the tightest perms known to mankind. In a not very interesting sub-plot, Jonie moans incessantly about the fact that Chuck has gone off the idea of marriage (which could be because of that perm). He makes it up to her by balancing a beer can on her head (!) (which at least makes practical use of the perm), and they take a slo-mo walk through fields accompanied by some particularly cheesy musak. 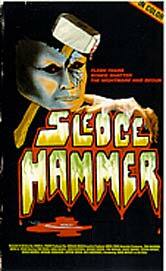 In fact, SLEDGEHAMMER features at least a dozen slo-mo scenes; with every murder taking place at a snail's pace. Either the director was overly enamoured with this technique, or he seriously needed to pad out the running time. However, the five minute (well, it seemed like it) meander through the fields really was taking the biscuit. The only other interesting character quirk is that one of the girls says (in what I think is meant to be a red herring) that her boyfriend wears a mask in bed – only he doesn't wear it on his face. Eh? After all the high (and low) jinks of the first half of the movie, SLEDGEHAMMER does deliver some entertainingly low rent thrills and spills. The acting is similarly low rent, but certainly isn't nearly as bad as some teeth gnashing I've seen in other comparable films. The film makers and the cast seem to have a sense of humour about what they're doing (without going over the edge into complete parody), and that makes for a pleasingly enjoyable popcorn munching time. Also, whilst it's certainly no HALLOWEEN (1978) the killer in SLEDGEHAMMER, whilst supernatural in nature, thankfully doesn't pre-empt Freddy and all the wisecracking buffoons that followed the next year. Slow, methodical and silent, and not unlike the TEXAS CHAIN SAW MASSACRE's (1974) Leatherface (except here in a creepy semi-translucent mask), he cuts quite a formidable figure. The fact that he can seemingly teleport around the house, and is impossible to hide from gives SLEDGEHAMMER a semi-nightmarish feel. It also manages to be quite suspenseful in parts, which is more than can be said for quite a few higher budgeted flicks of its ilk. To add to the cheese factor, the last man standing takes off his shirt to take on the killer for no other reason than to show off his six pack (which could be something to do with the fact that he was Playgirl Man of the Month centrefold in March, 1984)! However, the low budget is painfully obvious in places, no more so than the particularly uninspiring location which takes minimalism to a new level (it looks like they shot this in a new build condo with uniform white walls and cream corridors). All the slo-mo becomes a little bit of a running joke, too – no more so than the murder of the couple that takes place at the start is repeated in its entirety during the seance but this time in sepia (but just as slowed down!). There is also a few sound problems, with one character being practically impossible to understand (although that might be more to do with the poor transfer). This was David A. Prior's first foray into the wonderful world of movie making (and he's still cranking them out today). Fans of cheese will hold him dear for his 1986 slasher trash classic KILLER WORKOUT (aka AEROBICIDE).